Tony Leung gets ready to die in Ashes of Time Redux. The Skinny: A classic returns, but did they have to mess with it? The cleaned-up visuals are a wonder, but the reworked soundtrack and new edits are questionably necessary. A classic no matter how you slice it, thanks to Leslie Cheung, Maggie Cheung, Brigitte Lin, Tony Leung Chiu-Wai, etc. That Wong Kar-Wai guy and his buddy Christopher Doyle aren't so so bad either. by Kozo: Ashes of Time Redux provokes mixed feelings. One immediate emotion is elation, as this is Wong Kar-Wai revisiting one of his classics, restoring the elements to the quality they deserve. Another possible emotion is disappointment, as Wong has tinkered with his original 1994 cut, and the changes are arguably beneficial. In going back to Ashes of Time, Wong chose to modify the film for a post-In the Mood For Love/2046 audience, and one has to wonder if the effort was really necessary. Two action sequences were removed, the remaining one truncated, the music score reworked, and the film reedited for smoother pacing, a more reverent tone, and - one would imagine - more coherent storytelling. Still, the feeling that Redux evokes is largely the same as fifteen years ago. What has really been gained by Wong's tinkering? Aside from the most superficial elements, probably not that much. Not that the superficial elements aren't reason to applaud, because they are. Wong Kar-Wai's films are critically acclaimed in part because of their stunning way with sight and sound, and Redux is candy for the senses. Wong Kar-Wai and his pals have given Ashes of Time the full A/V workover, easily running rings around the murky prints seen on previous DVDs or laserdiscs. Colors are more vibrant and the sound has been newly remixed and corrected. Gone is Brigitte Lin's Cantonese-dubbed voice, with her sync Mandarin voice restored. Now that Lin's dialogue matches her lips, the film is spared the rushed feel that non-sync sound creates. Ashes of Time was always a quality film, but now it resembles slapped-together Hong Kong Cinema even less. Furthermore, Frankie Chan and Roel A. Garcia's synthesizer score has been reworked by composer Wu Tong into fully orchestrated accompaniment highlighted by cello solos by Yo-Yo Ma. The original score was bombastic and melodramatic enough that modern audiences may have been put off, but it was, in its own way, the perfect complement to these iconic martial arts characters. Along with the excising of the undercranked martial arts sequences, this change seems to move the film further from the "Hong Kong Cinema feel" and closer to the stately elegance of a 21st century cinema wuxia - albeit with some expressionistic style emphasizing art over narrative. Since the elegant wuxia is no longer a new thing, Ashes of Time feels less novel than it did fifteen years ago, and only seems to conform to the current trend for big budget martial arts movies. The original work felt like a new and daring take on a popular cinema genre, possessing of more overt thematic depth than commercial fare, and an over-the-top vibe that made the film both kitschy and enthralling. Redux arrives as a less accessible cousin of Crouching Tiger, Hidden Dragon, minus the huge set pieces or the overly-balletic Banquet-style martial arts. The film is still riveting and deliriously enthralling, but fifteen years later, the result feels slightly hollow. Does this mean that Ashes of Time is now a lesser film? No, not at all. Perhaps Redux can be called a lesser endeavor, as the film arguably needed reediting. However, the power of Ashes of Time is hard to deny, Redux or otherwise. The film starts in an alienating fashion, and requires knowledge of Jin Yong's original characters to fully grasp Wong's audacity. 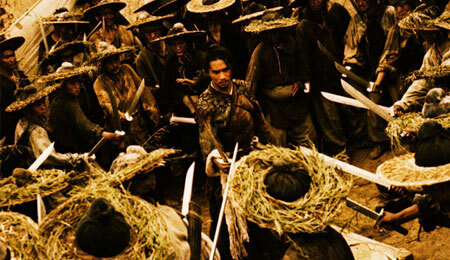 However, once the film moves beyond the overwrought Murong Yang/Murong Yin segment and into the story of Tony Leung Chiu-Wai's blind swordsman, the film finds its emotional footing. No matter how you slice it, this is still Wong Kar-Wai being Wong Kar-Wai; the focus is character and emotion over action and story, and there's no mistaking his pained characters and paralyzing emotions. Wong brings these gorgeous martial arts heroes closer to his audience, revering them by making them flawed, deluded human beings. It worked then and it works now.